AHMEDABAD: The BJP today asked the Congress party to make its stand clear on the Ram Janmabhoomi issue after party leader Kapil Sibal sought deferment of the hearing on the title dispute till the conclusion of the 2019 Lok Sabha elections. 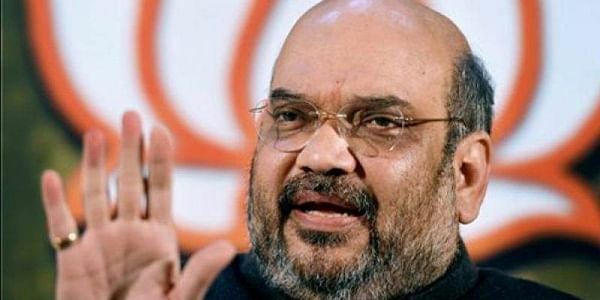 BJP president Amit Shah accused the Congress of adopting "double standards", saying, on one hand, Congress vice-president Rahul Gandhi is on "election tour of temples (mandir ka chunavi daura) in Gujarat, while on the other his party wants the hearing on Ram Janmabhoomi-Babri Masjid title dispute to be deferred. Shah told reporters here that the entire country wanted the case to be heard soon, but when the matter came up in the Supreme Court today, Congress leader Kapil Sibal, appearing for the Sunni Waqf Board, sought its deferment till after the 2019 general elections. The BJP chief said Gandhi should make the Congress's stand on the issue clear. He said the party should tell if it is in agreement with Sibal's views. "Kapil Sibal vehemently opposed building a Ram temple in Ayodhya. Sibal, who came prepared with a brief from his Muslim petitioners, was adamant on stopping the construction of the temple. When the apex court overruled his submission, he even tried to leave the court," he said. "I want to appeal to Rahul Gandhi to make clear the Congress's stand on the Ram Janmabhoomi issue. I also want to ask the Congress if it is in agreement with Kapil Sibal's views and whether his views are the official stand of the party," Shah said. He said the BJP and the entire country want the case to be heard and decided as early as possible. Sibal, while arguing for the Sunni Waqf Board told the Supreme Court today that since the court's decision in the case would have "very serious ramifications", hearing be deferred till July 2019 by which time the general election would be over. "Please fix the matter in July 2019 and we assure that we will not seek any adjournments... justice should not only be done, it should seem to be done," Sibal told the court. The special bench headed by Chief Justice Dipak Misra today also "prima facie" rejected the demand by a battery of lawyers including Sibal and Rajeev Dhavan that the appeals against the Allahabad High Court order be either referred to a five or seven-judge bench keeping in mind the sensitive nature of the case. The Allahabad High Court had in 2010 ordered a three-way division of the disputed land which has been challenged in the Supreme Court. The apex court today decided to hear the matter on February 8 next year. Targeting Sibal, the BJP chief said,"Whenever the Congress wants to say something different, it fields Kapil Sibal. They made him say zero loss had occurred in the 2G spectrum case. "He was also fielded to convey to the agitating (Patel) community in Gujarat that it is possible to give reservation by breaching the 50 per cent cap on quotas put by the Supreme Court," he said.